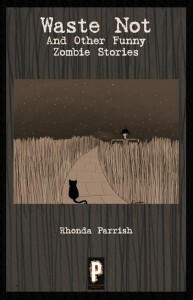 Waste Not (And Other Funny Zombie Stories) is a fun little collection of humorous and off-beat zombie stories from Rhonda Parrish. Zombies aren’t generally my thing (I don’t know why, they just creep me out) but I do love a good dose of dark humor, which Parrish definitely delivers! Follow the Yellow Bri–ZOMBIES! RUN! I’d have to say that …Oh My! had the highest traditional zombie ick factor, but it was such an interesting concept that I didn’t mind too much. I loved the cat’s eye view of the zombie apocalypse in Feeders, but my favorite has to be Waste Not. It’s the shortest of the three, but it packs a punch! The Kindle edition of Waste Not (And Other Funny Zombie Stories) is $1.99 or free when you purchase a paperback copy. Highly recommended to fans of zombies, the Land of Oz, cats, and dark humor.